1. The right word _____________. 2. _________ and shut the door quietly, please. 4. _____________ is where you'll find me. 5. Ooh! What is that ______________? 6. ________ is a good idea. I am a little early but it's up. I'm also early, but figured I'd better get my answers posted in case I don't get to it tomorrow. I am doing this early so I don't forget again. Here is mine. Mine is up! And ready to be appreciated ;) LOL! Mine's posted. Happy weekend everyone! And in the top 10! Been a crazy few weeks, so I'll post tonight instead of tomorrow. Wow! Everyone is up early. happy Friday! mine's up here! Mine will be up at 12 a.m. See my answers here. 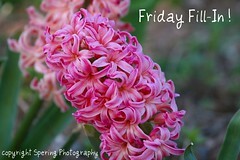 Mine are up:) Happy Friday!!! Have a great first spring weekend! Yay! I'm blogging again and my first one is here! Yay for Spring! Mine is up. Playing again after a long time. My Friday Fill-ins are up now. I hope everyone will have a wonderful weekend. Mine can be found here. Have a great Friday everyone! Mine is up.. care to visit? A bit late, but I made it! Good morning, everyone. My answers are up. Happy FF everyone and enjoy the weekend! Mine's up! I'm back and absolutely enjoyed this week's prompts. Mine are at the end of this post, so you'll have to wade through some other stuff to get to them :-). 1. The right word _can melt my heart into a big puddle of goo_. 2. _Go out of here_ and shut the door quietly, please. 3. Up _in the sky was this big yellow ball last weekend, but it seems to be missing now_. 4. _Curled up with a book_ is where you'll find me. 5. Ooh! What is that _because it smells soooo good_? 6. _Spending time with friends_ is a good idea. 7. And as for the weekend, tonight I'm looking forward to _an Arisia dinner_, tomorrow my plans include _going to PAX East_ and Sunday, I want to _take it easy, but I have grocery shopping and an Arisia meeting_! And I am so glad Friday has arrived. Ooooh, Shiny! Mine are HERE. Have a great weekend! My Fill Ins are up here! Mine are HERE, glad I found this, love it! This is my first friday fill-in! Here are my answers. I've enjoyed reading everyone else's. First time doing one of these. As usual I am late! Here are my answers anyway. Hope u have a gr8 weekend Janet! Late once again, but posted. Have a wonderful weekend!